The Backblaze B2 cloud storage is a popular choice by Duplicacy users, likely because of the lowest storage cost (at 0.5 cent per GB per month, although additional charges for API calls and outgoing traffic do apply). 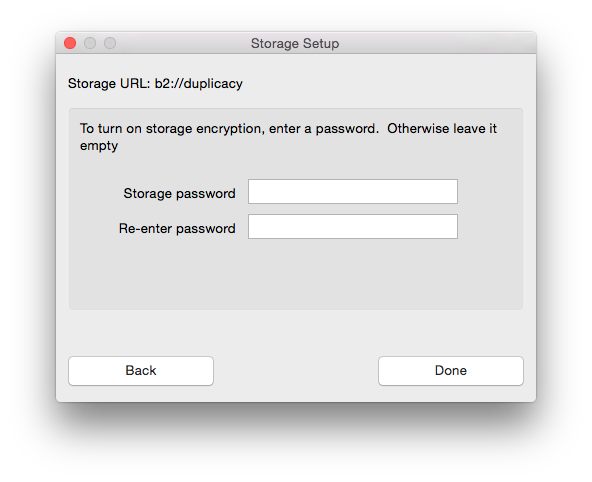 If the bucket has not been used as a Duplicacy backend before, the dialog will allow you to optionally choose a storage password twice that will be used to encrypt backups to be uploaded. If you leave the password empty, the storage will not be encrypted, and anyone else who can access the bucket can access your backups too. If the bucket has already been configured before, you are required to enter the previously chosen password if the bucket is encrypted; otherwise the encryption dialog will not be shown. 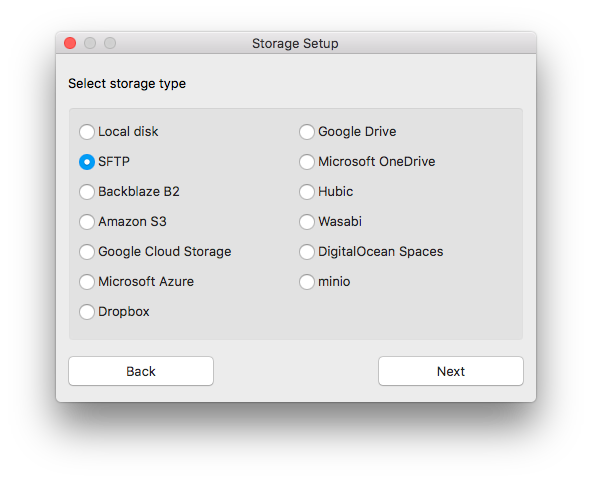 This completes the configuration of the Backblaze B2 storage backend, and now you should be able to perform backup operations. Please refer to the complete User Guide for more information. To use the Backblaze B2 storage with the command line version of Duplicacy, enter a storage url in the format of b2://bucket, where bucket is the name of the bucket to be used. You will then be prompted for entering the account id and application key. On Windows and macOS, these credentials will be saved in an encrypted password vault provided by the OS and retrieved later when needed. On Linux, if such a password vault is not available, you can store them in two environment variables, DUPLICACY_B2_ID and DUPLICACY_B2_KEY, in order to avoid typing in them ever time.